State committee members will discuss the measure when they gather Tuesday night in Lawrence. Earlier this month, charter opponents initiated the air war when they launched an $800,000 ad arguing against the expansion of charter schools, which are controversial because they do not have to be unionized, operate independently of local districts, and are given more flexibility to set their curriculums, budgets, and staffing. That ad also lists its top donors, all teachers unions: the Massachusetts Teachers Association, the American Federation of Teachers, and the National Education Association. Such disclosure is required under a 2014 state law designed to shed light on the powerful interests that bankroll election-year propaganda. But the procharter ad is so heavily subsidized by groups that do not have to disclose their donors that trying to trace the money is like opening a Russian nesting doll, said Maurice T. Cunningham, a political scientist at the University of Massachusetts Boston, who has done his own research into the organizations. State and federal records show many of the groups are led by, or have close ties to, investors in Boston and New York who have spent millions on lobbying and advertising to promote charter schools in other states. The organization that bought the ad and is leading the campaign in this state is called Great Schools Massachusetts. As a ballot committee, it is required to disclose its donors, and they include billionaires like Abigail Johnson of Fidelity Investments and Seth Klarman of the Baupost Group, as well as top executives from Bain Capital. But some of the group’s biggest donors are nonprofits that do not have to reveal their funders. One of them has a strikingly similar name: Great Schools for Massachusetts. It was established in February, and initially spent nearly $193,000 to lobby state lawmakers. Wealthy donors, through their contributions to the nonprofit, are helping to finance the new ad, but do not have their names disclosed, as they would if they cut checks directly to the ballot committee that bought the ad. Eileen O’Connor, a spokeswoman for Great Schools Massachusetts, the ballot committee, defended the group’s backers. “The campaign is excited to have a widespread, bipartisan coalition supporting its mission to provide educational opportunities for all children in the Commonwealth, and will continue to strictly comply with all campaign finance regulations,” she said in a statement. Paul S. Ryan, deputy executive director of the Campaign Legal Center, a nonpartisan group that advocates for greater transparency in political spending, said some wealthy individuals set up nonprofits because they genuinely want to promote a cause they believe in. But increasingly, he said, individuals, unions, and corporations are using nonprofits as a way to influence elections while shielding themselves from public scrutiny. Some donors worry that, if their names were disclosed, it would hurt the image of the candidate or cause they support, or damage their own brand, he said. In 2010, for example, the retail giant Target faced boycotts and protests after it donated $150,000 to a group that supported Tom Emmer, a Republican candidate for governor of Minnesota who opposed gay marriage. And in the 2013 Boston mayor’s race, a super PAC called One Boston launched a $500,000 ad to help Martin J. Walsh, a former labor leader who at the time was trying to show he was not beholden to unions. Only after Walsh won the race did the American Federation of Teachers acknowledge that it paid for the ad after routing the money through a nonprofit called One New Jersey. ►Education Reform Now Advocacy is an arm of Education Reform Now, a national organization that promotes charter schools. According to 2014 tax records, the most recent available, the president is Joe Williams, a former executive director of Democrats for Education Reform, and the policy director is Charles Barone, another staffer at that organization. Neither returned messages seeking comment. In 2010, the group ran an ad in New York criticizing the state’s elected officials for not supporting President Obama’s push to expand charter schools. “Stop listening to the teachers unions!” one woman says in the ad. ►Strong Economy for Growth has been active in Republican politics. Founded in 2013 by Ernesto DiGiambattista , chief executive of Cybric, a Boston corporate security firm, it sent direct mail opposing Democratic Representative John Tierney in his successful 2012 reelection campaign against Republican Richard Tisei and gave $165,000 to help Scott Brown when he ran unsuccessfully for Senate in New Hampshire in 2014. DiGiambattista could not reached. A man who answered a phone number listed for him said he would pass on a message to him. ►Great Schools for Massachusetts’ president is Jon Clark, codirector of operations of the Brooke Charter School network; the treasurer is Christopher W. Collins, a cofounder of First Atlantic Capital, a Boston real estate investment firm; and the clerk is Naomi Roth-Gaudette, managing director of organizing at Families for Excellent Schools. Clark and Collins did not return messages. 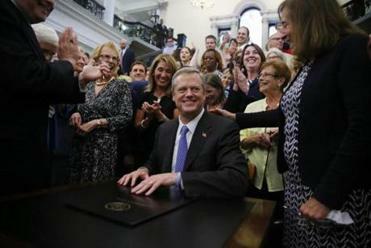 ►Expanding Educational Opportunities was set up July 1 by Bryan Jamele and Valerie Boyns, two employees of the Massachusetts Competitive Partnership, which is regarded as the state’s most powerful and private business group. Its members include top executives from Fidelity, Bank of America, Vertex, and the Patriots, among others. Because it was established as a ballot committee, and not — like the other four — as a nonprofit, it will have to disclose its donors on Sept. 9, the next legal reporting deadline. Follow him on Twitter @mlevenson.